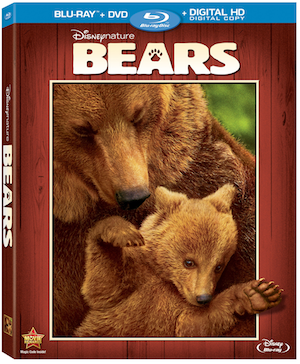 #Disney: Disneynature Bears coming to Blu-ray Combo Pack on August 12! Disney Movies Anywhere, and On-Demand, Aug. 12, 2014! Burbank, Calif., June 13, 2014 – From Disneynature, the studio that brought you “Earth” and “Chimpanzee,” comes the must-own true life adventure “Bears,” available on Blu-ray™ Combo Pack (Blu-ray + DVD + Digital Copy), Digital HD, Disney Movies Anywhere (DMA), and On-Demand, Aug. 12, 2014. An epic story of breathtaking scale, this heartwarming and visually spectacular film showcases a year in the life of a bear family as two impressionable young cubs are taught life’s most important lessons. Families everywhere can now travel to a majestic Alaskan wilderness teeming with life without leaving home as “Bears” arrives on Blu-ray™ Combo Pack, and Digital HD featuring stunning high definition picture, transporting sound, and exciting bonus features both parents and their children will love. “Bears” was directed by Alastair Fothergill (“Earth,” “African Cats” and “Chimpanzee”) and Keith Scholey (“African Cats”). It features narration by John C. Reilly (“Wreck-It Ralph,” “Chicago” and “Talladega Nights: The Ballad of Ricky Bobby”). · Welcome To Alaska - Journey with the filmmakers into the Alaskan wilds to film Sky and her cubs. · The Future For The Bears - Experience the thrill of living with the bears during production, and the importance of protecting the wilderness to ensure their survival…and our own. · A Guide To Living With Bears - Learn how the team interacts safely with these magnificent creatures. · How Did They Film That? - Get an inside look on some of the extreme filmmaking that went into getting shots high in the mountains and under frigid cold water.